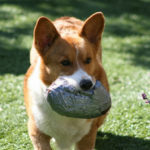 I recently ran a fundraising raffle here on The Daily Corgi, and gave $225 of ticket sales to National Mill Dog Rescue of Colorado Springs, Colorado. Some of you may have wondered why I chose to support this organization. A picture like this one is the most powerful explanation I can give. Lyric the Corgi is a former puppy mill dog. She was rescued by NMDR after living ten years under a sheet of plywood. She was deathly ill and it was believed that she would not survive through the day. However, Lyric and her fighting spirit would not give up. With treatment and extended care, she grew stronger every day and has survived. Lyric — and thousands of dogs like her — are the reason I donated to National Mill Dog Rescue this year. Because puppy mills are real. They exist, and dogs in them live (miserably) and die in too many of them, every year. Sometimes, when a mill gets raided and surrenders its dogs, many of the dogs are sick enough to be put down mercifully. They come out by the hundreds, in some situations, to be assessed and rescued — or not. If you buy a dog from a pet shop, the odds are 90% (more) that the puppy came from a mill. The dogs are a business, a commodity in the supply chain, and their lives matter only as long as they are money makers, in too many large scale mills. I don’t want to stir the waters among breeders of purebred dogs. I respect the ethical breeders. Among them are many doing the sincerely dedicated work of keeping the breed going and healthy. When they’re doing it right, they’re not doing it for money. They’re doing it for the love of the breed; it costs them money, and so far as I can tell, they are not living the high life off of the dogs. There will probably always be a demand for purebred dogs, and the work of maintaining the integrity of the breeds — from generation to generation — should rightly fall into the hands of those doing it for the love of the dogs. Let me be clear: not all kennels/breeders are puppy mills! Nevertheless, puppy mills exist. Ask anybody with genuine experience in the rescue field. So many have seen things I could not personally stomach. I don’t share photos on this blog I can’t bear to look at, but a quick Google for “puppy mills” will pull up images you might not soon forget. No animal deserves the kind of life some breeding dogs live, for years at a time. A life where veterinary care is virtually non-existent, where shelter is paltry, where they never leave cages or runs, and they don’t know the touch of a caring hand, the fun of a fetch, the languor of a lazy nap in the arms of a loving human. Out of these awful places come many, many cute puppies. But the breeding dogs are left behind, and they suffer. The problem is bigger than me and you. It can be argued (and has been — vociferously) that taking these dogs from mills, when they are no longer useful for breeding, perpetuates the puppy mill cycle, because those in the business will simply acquire more dogs and start again. There is logic to that argument. There is a hard line case to be made. I leave those arguments to the people who believe passionately in them, and know that they are often the same ones working for necessary changes. If you are set on a Corgi (or any purebred dog), know your breeder. Do your homework. There are good breeders, and yes — they are often selective with their placements and have wait lists. If you absolutely cannot wait, or afford the price, know that twenty five percent of dogs in shelter are purebreds. Many are mixes. I’ve seen a great many beautiful Corgi mixes … the Corgi genes tend to dominate, if you know what I mean. Get on Petfinder.com and see what’s out there. Locate a breed rescue group in your area and let them know who you are, what you’re all about, what you are looking for. Know all about the dog you are taking in: are you ready and able to handle the dog’s temperament, medical care, genuine needs for company, recreation and exercise? Rescue people (including transport and foster folks) do heartbreaking, never ending work, and they don’t do it for money; they need money. Give to them. There are costs associated with rescuing dogs, vetting them, feeding them, treating their conditions, not to mention the transport, which is often so vital in delivering a dog to a second chance situation. Though they may seem high, what kind of value can you put on the life of a dog — or the tireless work of a rescuer? But the dogs in the big mills don’t have the luxury of options. That’s why I gave to National Mill Dog Rescue this year. Because all dogs matter, and honestly, I believe there are enough of us dog lovers in this country to make a serious dent in the overall misery of dogs. Do your part, where you can. Like me, you can’t lick the whole problem. You can only do your part, no matter how small, and at the end of the day, be satisfied that you have done what your love and conscience called you to do. It’s a satisfaction unlike any other. I am needed, and so are you. More than you may know! We are among the ones who can make a difference, and we do. Let’s keep it up and do a little more. Or a lot. Whatever you are called to do, if it is within your capacity, do it. Every act of compassion, of courage, of generosity matters to the dogs. It’s a privilege to care as much as you do. It’s a gift to care, and doubly a gift to extend that care where it’s needed most. Merry Christmas, my friends. 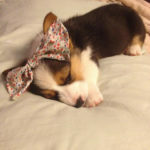 Thank you for being a part of The Daily Corgi community. I appreciate you, every day, and I believe in the potential for change our numbers represent! The Daily #Corgi Happy Howlidays Rafflepalooza: Twenty THREE Prize Packages! 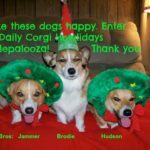 Friday Freebie: A CorgiPals Bonus Post! 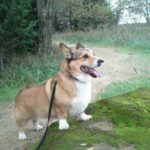 Calling All Corgi Nation Votes for Benny and Corgi Rescue!